Solar Panels are becoming more common place and investing in a solar photovoltaic system is a smart solar solution for most homeowners. This now proven and reliable technology offers long-term performance with low maintenance. The latest solar panels and PV systems are cheaper, easier to install, maintain and operate more efficiently than ever before so its important to know how to size a solar system in order to get the best from it. The primary goal of any photovoltaic solar system is to offset all or some of your electricity needs with free power from the sun. The percentage of your energy needs that you will be able to supply with a solar system will depend on many factors, including your homes (or other location) power consumption, the efficiency of the system you install, and where your home is located. Ideally for solar panels this would be somewhere that experiences cold temperatures to keep the panels cool but that also receives plenty of sunlight to generate lots of free power. Sizing a solar system can be tricky, especially if you are installing a system in a new home, RV, mountain cabin or do not know your homes energy needs. In such cases, how do you know how many solar panels or how much solar energy you require. You could “guesstimate” your annual energy usage if you know your energy consumption patterns or have details of your energy bills. Having a reasonably accurate estimation of your energy consumption will help you design the correct size of the solar system you need. For this simple example, let’s assume we want to design a solar photovoltaic system for an off-grid garden summer house (or shed) with battery back-up for the use of lighting at night. How would we size a solar system for such an application. What most people do first is to make a list of the power consumption of all the electrical appliances and devices that will be used in their particular home or location and an estimate of how long each appliance or device is switched-ON using energy each day. Once this is complete multiply the power consumption (in watts) of each device by the number of hours it is on to give you the daily electrical consumption in watt-hours, as shown. Then the total energy consumption is estimated at around 1440 watt-hours, or 1.44 kilo-watt/hours per day. However, it is better to add a little extra on top, say 25%, to account for losses in the system, or the use of an extra electronic device. Then the new estimated value would be: 1440 watt-hours x 1.25 (25% extra) = 1800 watt-hours or 1.8Kw/hrs. As solar power generation is based on incident sunlight on the PV panels rather than heat, it is necessary to know how many hours of direct sunlight the panel or panels will be exposed too throughout the day. The amount of energy you can get from solar electricity at an off-grid site depends on its location and the time of the year. Generally in the northern hemisphere you can expect to receive more sunlight between the months of April through to September and have a clear exposure to the sun for most of the day, e.g. 9am to 3pm. A solar PV panel produces the most power when it is pointing directly to incident sunlight, so that the sun’s rays shine straight down onto its surface. The solar panels should be located and angled to where they will receive as much sunlight as possible, averaged out during the course of the day, a month or a full year. Fortunately, most homes and gardens have good solar access with roofs that are often free from obstructions that can shade the solar panels. The measurement for the strength of the sunlight striking the Earth at your location is defined as solar insolation and you’ll need to know the peak sun-hour figure for your location. Having a good solar site is important to ensure that the PV panels are exposed to bright sunlight every day of the year. Generally during the winter season this can be as low as 4 hours or as high as 8 hours during the summer season. Fortunately there are plenty of good websites available such as: NASA’s Solar Insolation Website. Using this solar insolation database can help size the minimum solar electric (PV) system needed during the periods of the year with the shortest amount of sunshine for your particular site or location. Lets assume then that for our particular location the lowest solar insolation occurs during the month of January with only 4.8 hours of sunshine per day. Therefore, the total peak power generated by the sunlight in the month of January will be: 1800 watt-hours/4.8 hours = 375 watts-peak, or 375Wp. This could be rounded off if required to 400Wp. We already have an accurate idea of the solar insolation for a particular site. We’ve done the electrical loads list survey so we know how much electric power we require on an average day. All that remains is to specify the type and number of photovoltaic (PV) panels that will produce the required power of 1.8 kilo-watts. There are literally hundreds of different solar panels to choose from and all vary in type, size, shape, and voltage rating. In most cases the size of a photovoltaic panel refers to the panel’s rated output wattage or electricity generating potential. Solar panels can also have different voltage ratings depending upon their size. Those with of 12 to 48 volts are generally used for off-grid applications. Maximum power ( P ) delivered by a panel is given as Voltage ( V ) x Current ( I ). For our particular off-grid example we required battery storage and back-up so the system will be powered using 12 Vdc photovoltaic solar modules for convenience. 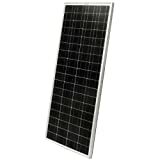 Again lets assume that we have done our research on panel availability, price, and size, and we have decided to use AKT 12 volt 100 Wp Solar Panels with the following electrical specifications: Pm = 100Wp, Vmp = 17.5 Vdc, Imp = 5.7A, Voc = 21.0V, Isc = 6.2A. Then the number of PV panels required will be: 375Wp/100 Wp = 3.75 = 4 solar panels rounded off to the nearest whole panel. So our garden summer house example will be powered by at least four 100W AKT solar photovoltaic panels with the four panels connected together in parallel to give the required system voltage of 12 Volts. Unfortunately the sun does not always shine, especially at night, so some additional backup is required. During a nice sunny day, the solar panels can produce a lot of electrical power so to allow us to use the summer house during the night, winter time or during periods of low solar insolation, we will need batteries to access that power after the sun goes down. The amount of energy that will be consumed per day in the summer house was calculated at 1800 watt-hours previously using the information above. This is the minimum amount of storage capacity we need for one day. Next we need to determine the number of days of battery back-up that we want to have on hand. This is called “Autonomy”. Appliances use 1800 Watt-hours/day, nominal battery voltage = 12 volts, days of autonomy will be 3 days and efficiency = 85%. Battery capacity = (1800 x 3)/(0.85 x 12) The total ampere-hours required is therefore 529Ah or greater of battery capacity at 12 volts. For systems in continuous operation the industry standard 1.2 (20% extra) de-rating factor is specified to prevent the controller from becoming damaged due to excess solar panel current or power. The solar panels above have a short circuit current (Isc) of 6.20A. The solar charge controller rating will therefore be: 4 solar panels with rated current of 6.20A each = 4 x 6.20 x 1.2 = 29.76 A or 30Amps. So the solar charge controller like the one on the left should be rated 30 Amps at 12 V or greater. We have calculated that for our simple example, we would require four 100Wp solar panels, and a 30 Amp solar charge controller to charge the 12 volt batteries. Unfortunately, this set-up will not power large TV’s, home computers, fridge/freezer, etc, as these devices require 240 VAC to operate. Then we need to transform the 12 DC voltage into 240 volts AC (alternating current) and to do this we need a sinewave inverter like the one on the right. The total wattage of all electrical appliances that we listed above for use in our garden summer house was: 120 + 20 + 50 + 70 + 50 + 10 = 320 Watts. For safety, the inverter should be considered 20-25% bigger size. The inverter size should therefore be about 400 Watts or greater. Then for our simple example above of an off-grid back yard type summer house, we would need four 100Wp solar panels, a 30A charge controller feeding a single or set of batteries rated at 529Ah, plus additional 16mm2 (10AWG) cabling and 30A isolator switches. If we also wanted to power our electrical appliances using 240VAC, a DC to AC inverter of about 400 watts would also be required. Hopefully by now you will have some idea of how to size a solar system for your home or garden, whether off-grid with battery backup or grid-tied. These steps in determining the size of solar system are by no means the only ones, each case is different and there are different ways in sizing solar PV systems. But the first step in going solar is not the size of the solar system, but reducing electricity usage through conservation and efficiency measures. Energy conservation and good home design plays an important role in keeping down the size and cost of a photovoltaic (PV) system. The use of energy efficient appliances and lighting, as well as non-electric alternatives wherever possible, can make an off-grid solar photovoltaic or even wind powered system a cost competitive alternative to the utility power grid. The amount of sun-hours per day, days of autonomy and your homes average energy consumption will determine the size and ultimately the cost of any photovoltaic solar electricity system. Negative-watt-hours are the watt-hours you can save by conserving energy and not using it in the first place. The cost of reducing your energy consumption with negative-watt-hours is about 20 to 30% cheaper than producing those same watt hours using an oversized PV system. Plus, the resulting smaller system means fewer solar panels, less space and less cost. To learn more about solar energy, photovoltaic panels, or to learn how to build your own solar energy system using AKT’s 100W panel to save money, Click Here to find more solar panels and start generating your own solar energy today. As a student undertaking research in this field, it is a good article. working out the size of the panels and how many is the hardest thing. I installed a solar system in my back yard to power lights but needed to add two extra panels to keep them lit all night. this is an interesting article.